If you would like to be able to put on some warm clothes at the end of your run, we recommend using our Warm Clothing service. Storage areas will be manned by volunteers and marshals on Race Day and it is strongly recommended that you avoid placing valuables in clothing bags. Organisers do not accept any responsibility for lost or stolen goods. Any clothes left in areas other than the designated Warm Clothing areas will be donated to the Red Cross inc. anything left at the start line. 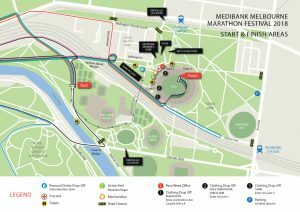 We highly suggest that all competitors take public transport on the day, due to limited parking space, traffic congestion on race-day and the convenience and close proximity of public transport from the start line and MCG. 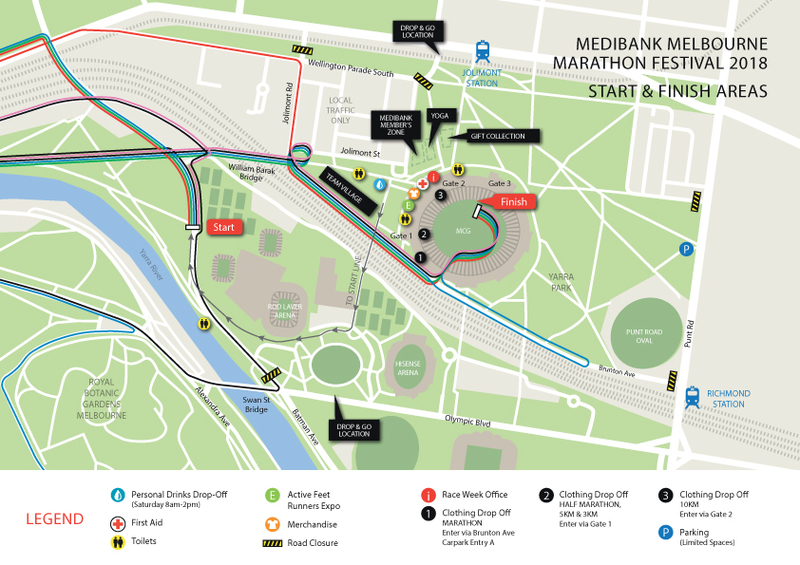 There will be limited public parking at the MCG in Yarra Park for the Medibank Melbourne Marathon Festival. Enter from 5am through Gate 3,5 & 6. (Gate 6 will become an exit gate from 8am). Once you find a park, walk across Swan St Bridge and take the footbridge over the rail lines next to Rod Laver Arena. This leads directly to the MCG’s Ponsford Stand. Allow 10 minutes walk time. Once you find a park, walk to Wellington Parade Sth/Jolimont Terrace and use the MCG paths to the Ponsford Stand or Gate 3. Once you find a park, walk across Morell Bridge and take the footbridge over the rail lines next to Rod Laver Arena. This leads directly to the MCG’s Ponsford Stand. Allow 20 minutes walk time. For Public Transport options please visit the PTV website. With thanks to PTV, all Marathon competitors will now have the option to catch the Night Network to the start line. Click here for Night Network website. Normal Myki fares & ticketing will apply. Please note the most convenient train stations to arrive at are the Flinders St, Jolimont and Richmond stations. There are plenty of Bike rack facilities at the MCG. Remember to bring a lock! If you plan on walking to the event, please remember to review the road closure information closer to the event. Come along and support your friends and family – entry into the MCG is free on Race Day! Spectators can enter the MCG from 6:00am via Gate 2. Bikes and Pets are not permitted inside the MCG (Guide Dogs excepted). Competitors will have access to toilets at the MCG via Gate 1 from 5:30am on Race Day right through until the venue closes at 2:00pm. Limited portable toilet units will be available at the Start Line. We encourage competitors to make use of the portable toilet in Yarra Park and the permanent, toilet facilities offered at the MCG. From there it’s just a short walk over the Tennis Centre footbridge to the Start Line. There will be portable toilets available to competitors at the Drink Station locations on the course. Spectators can access MCG toilets via Gate 2 from 6:00am. Please note that all toilets are located downstairs at the MCG on Level B1. Massage will be made available to Marathon and Half Marathon competitors only. This area is located within the MCG on LB2 via Car Park Entry A on Brunton Avenue. Please follow directional signage and Volunteer instructions to locate this area. Trophies will be awarded to the place getters in the Medibank Melbourne Marathon, the Sri Lankan Airlines Half Marathon, ASICS 10km Run and 5km run events on the main stage, inside the MCG. All competitors will receive a finisher’s medallion on their way out of the finish area. Once you have finished your event, please move through the finish area as quickly as possible to avoid congestion for other competitors wanting to cross the finish line. All competitors are invited to present their race bib at the Gift Collection tent to collect a free Competitor Gift! Visit the Yarra Park Lawn opposite Gate 2 of the MCG to pick up your gift. There will be road closures around the MCG that will affect traffic and access to parking on race day. If you have an enquiry about traffic and road closures, please contact our dedicated Traffic Enquiries Line. Operational Saturday 13th October (10am – 4pm) and Sunday 14th October (6am – 2pm). In the event of extreme weather or surrounding conditions, and in the interests of competitor safety, IMG reserves the right to cancel or delay an event/s at short notice. Cancelled events will not be rescheduled. IMG will ensure that they provide a duty of care to all participants and staff, with the well-being of individuals being of highest importance. Extreme weather may be defined as weather that threatens the immediate or long-term safety of individuals, as a result of rain, lightening, wind or heat. Any adverse impediments that may occur over the event course that are deemed to be a safety hazard. Examples may include flooding, oil spills, vehicle accidents, fallen trees, or possibility of fires on total fire ban days etc. During the days preceding an event, weather forecasts (http://www.bom.gov.au/) will be monitored by IMG to identify any potential extreme weather conditions. During the event in the case of inclement weather, MEOC will communicate with the Weather Bureau regarding specific details of possible weather conditions including intensity, duration and likelihood. In the instance the event is adversely affected by extreme weather, consultation between IMG and relevant authorities will be held to determine the actions required with the safety of participants, staff and the public at the forefront of any decision made.